Can you imagine what life would be like if you couldn’t see more than a single window’s worth of stuff on your MacBook? Shopping would be curtailed quite a bit — and so would the contents of the folders on your MacBook’s drives! Click the scroll box and drag it. For the uninitiated, that means clicking the darker portion of the bar and holding down your finger on the trackpad while you move your finger in the desired direction. Click anywhere in the empty area above or below the scroll box to scroll pages one at a time. Hold down the Option key and click anywhere in the empty area above or below the bar to scroll to that spot in the document. Of course, you can also drag two fingertips across the trackpad to scroll a window’s contents (both vertically and horizontally). To control trackpad behavior, open System Preferences and click the Trackpad pane. 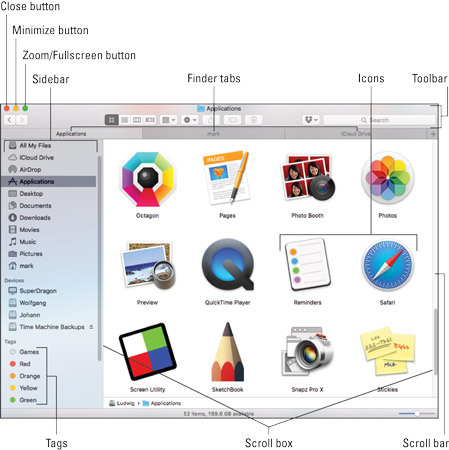 Here, you can see two horizontal scroll bars in a typical Finder window, as well as the Sidebar and three Finder Tabs. A plethora of helpful window controls. Often, pressing the Page Up and Page Down keys moves you through a document one page at a time. Also, pressing the arrow keys moves the insertion pointer one line or one character in the four compass directions. You can also resize most Finder and application windows by enlarging or reducing the window frame itself. Move the pointer over any corner or edge of a window, and then drag the edge in any direction until the window is the precise size you need.